With N hook Ch 4 with center color, Sl St to form ring. With next color attach in any Ch 1 corner space. Continue in the established pattern for one more row. Using the 6 different colors, make two motifs of each color for a total of 12 motifs. Ch 9 using White plarn and N hook. Repeat row 1 to create your strip by working even on 8 sts until your piece measures 32 inches long. Don’t finish off but leave your yarn attached should you need to add another row to your strip. If your strip is too short when you put your bag together this allows you to add a row without a problem. Using the J hook, assemble the 6 different colored motifs together with 6 to a panel. Each panel has three motifs across and two down. Make two panels. With right sides facing take one motif panel together with your long strip and place them with edges together. Starting in the corner, work a Sc through both layers to attached them together. Work down the sides, across the bottom, and back up the other side. FO. You will notice that using this method of attachment creates a raised edge seam around your entire bag. Tip: If your strip is too short when you join the first main piece, just crochet another row of Hdc so the strip is long enough to match to the top of bag at both ends. FO the strip once you have the first main piece and strip attached. Take the remaining motif panel and place it together at the top of your long strip. Starting in the top edge corner of the bag, work a SC through both layers to attach in the same manner as you did above. Don’t finish off. Leave yarn attached to work handles. Using N hook and white plarn still attached at top front edge of your bag, Sc evenly along the top edge of tote bag until you reach the center motif of front panel. Ch 14 for handle, skip over center motif and work Sc in ea remaining st of panel’s top edge. Continue working Sc around in ea st until you are at the other side’s center motif, Ch 14 for handle, skip sts again of center motif for handle and work Sc in ea remaining st of panel’s top edge. Do not connect or join at end of row, just continue working Sc in rounds. Leave plarn attached at end of round as you will continue from here once you complete round 2. Check your handles and make sure each side matches each other before moving on. Adjust your sts as needed to match. Attach separate piece of plarn at handle chain and Sc around chain of handle, (approx 18 Sc) evenly. FO and weave under ends at end of handle chain. Repeat again for other side’s handle chain to match. Pick back up plarn where you left off at end of round 1. Sc in ea st to handle. Sc in ea st of handle and Sc in ea st of bag. Repeat for other side to match and Sl St into next two sts at side of bag to finish off edge smoothly. FO and weave in ends. I love all your bags, but this one I REALLY love!! Thanks for posting the patterns! Thanks for the pattern. I’ve wanted to try using plarn – so will start with this one. I really like the additional width on the sides. I love your bags but this one really caught my eye! A few want to make their own and of I directed traffic here for some terrific patterns. i love your bag that a very googd idea. it is so lovely. I enjoy recycling. My sister-in-law found a newspaper article and she sent it to me, as I am always looking for patterns. 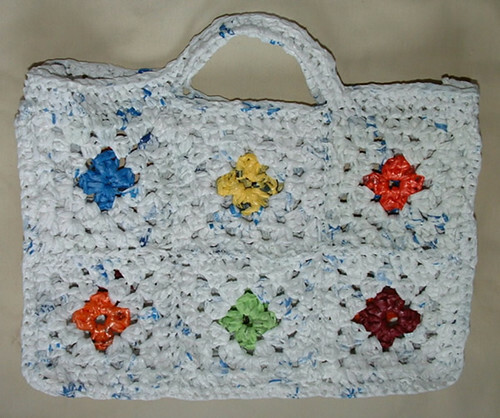 I really like the grannie square tote. Thanks for the pattern. Do I use size N or J to make the motif squares? Melissa, I used the N (9mm) hook for the motif and then the J to assemble it. I added this to the pattern instructions to clarify as it wasn’t clear. Thanks for stopping by and I hope you enjoy the pattern.